The Raspberry Pi® is a single-board computer that runs the Linux® kernel-based operating system and provides easy connections to peripheral devices, including a monitor, mouse, keyboard, and MCC data acquisition devices. With a cost of less than $40, the Raspberry Pi provides a cost-effective way to perform data acquisition. You can acquire data from most Measurement Computing USB DAQ devices using the Raspberry Pi and UL for Linux. Acquire data from an MCC DAQ device using a test application installed on a Raspberry Pi computer. This document is intended for application developers familiar with MCC DAQ devices who are interested in acquiring data on a Linux platform using a Raspberry Pi. Click here for a listing of MCC DAQ devices supported under Linux® and compatible with Raspberry Pi. The image below shows the Raspberry Pi configuration used to perform these exercises. You must install an operating system onto the Raspberry Pi before it can be used. This example uses Raspbian, which is a free operating system based on Debian, optimized for the Raspberry Pi hardware. NOOBS (New Out Of the Box Software) is an operating system install manager for the Raspberry Pi, and is used to install Raspbian in this example. You use an SD card to transfer NOOBS onto the Raspberry Pi. The SD card must be formatted to remove all previous information. The following procedures show you how to perform these steps. Watch the Video! Go to http://www.raspberrypi.org/help/noobs-setup/ to see a video showing how to format the SD card, download NOOBS, and install the Raspbian OS onto the Raspberry Pi. Go to www.sdcard.org and click SD Memory Card Formatter button. Scroll to the page bottom and select the SD formatter for Windows or Mac, follow the on-screen prompts, and then save the download on the computer. Install the SD card into your PC or Mac and run the SD_CardFormatter0500SetupEN.exe (SD formatter executable). Go to www.raspberrypi.org and click Downloads. Under the NOOBS section click Download Zip and save the file to your PC or Mac. Expand the zip file and copy all files to the SD Card. Remove the SD card from your PC or Mac, and install it into the Raspberry Pi. Connect the monitor, keyboard, mouse, and power. 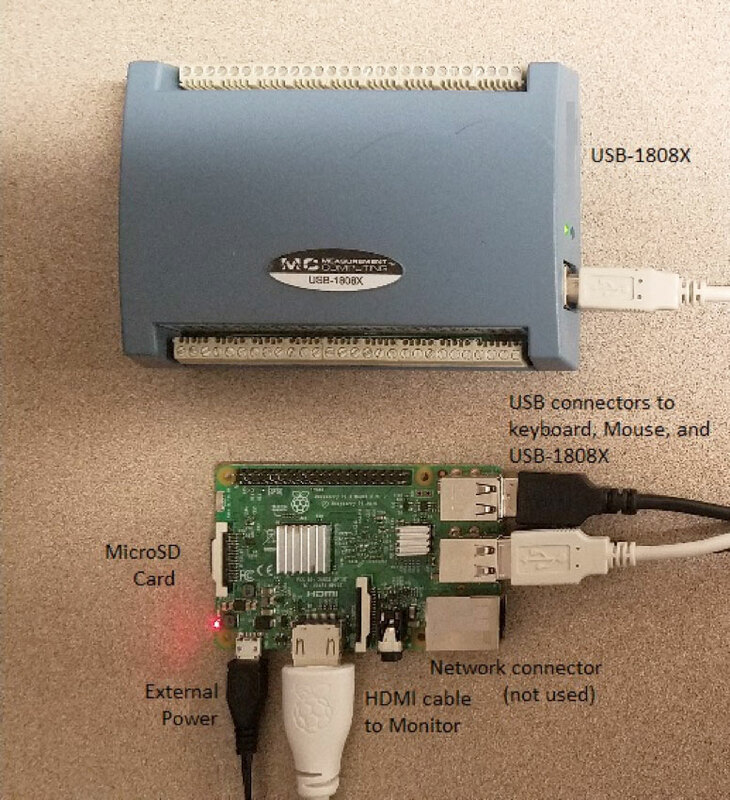 Connecting power will boot the Raspberry Pi. The Raspberry Pi Logo displays, followed by a NOOBS dialog box which shows a list of operating systems to install. Check the Raspbian checkbox and click Install, then select Yes on the Confirm dialog box to install Raspbian. A dialog box notifies you when installation is complete. Click OK; the Raspberry Pi starts loading Raspbian. If this is the first time booting Raspbian, a Setup Options menu appears. Use the keyboard arrow keys to navigate the menu. Set the configuration options, such as the language and regional settings to match your location. Tap <Finish> and press <Enter> when done setting configuration options. Congratulations! You have now installed the Raspberry Pi operating system. Before downloading UL for Linux, verify that the Raspberry Pi can access the internet. You can connect an Ethernet cable or connect a USB WiFi adapter to connect with a wireless network. This example uses the Pi’s built in WiFi adapter. Double-click the WiFi Config icon on the desktop to start the wireless configuration program. The Adapter: field lists the name of the USB wireless adapter (for example wlan0); the Network: field is empty. Click Scan to list the available wireless networks. Double click on the service set identifier (SSID) network name to which you want to connect. Verify the Authentication and Encryption fields on the connection window, and enter the password in the PSK (pre-shared key) field. The configuration program automatically connects to the newly configured network. Cycle the device power to reboot the Raspberry Pi and enter the login information above. After logging in, the command prompt displays pi@raspberrypi~$. To ensure that you have the latest Raspberry Pi software versions for each package installed, enter the following code from the terminal window to update the Raspberry Pi package list. Click the uldaq-1.0.0.tar.gz link to download the file. A dialog box appears, select Save file and click OK. The file is now downloaded. MCC test apps are developed on Linux and are available for Linux supported MCC devices in C and Python. The test apps perform all the device functions such as acquire analog, counter, and digital data (as supported), test device functionality, and display device information. Refer to https://github.com/mccdaq/uldaq, click on the link for ULHELP and select Index.html for the names of each test/example app. Pick an appropriate test app for your device. Each example performs a specific function of a supported device and is well commented for your review. Additional prompts appear if more information is needed, such as a channel number or frequency value. The examples run and the results displayed on the monitor. For more information about the Raspberry Pi, go to www.raspberrypi.org. Measurement Computing Corporation and the Measurement Computing logo are either trademarks or registered trademarks of Measurement Computing Corporation.